Following the words of Giorgio Agamben (from his 2001 article ‘On Security and Terror’), security has become the basic principle of international politics after 9/11, and the ‘sole criterion of political legitimation’. 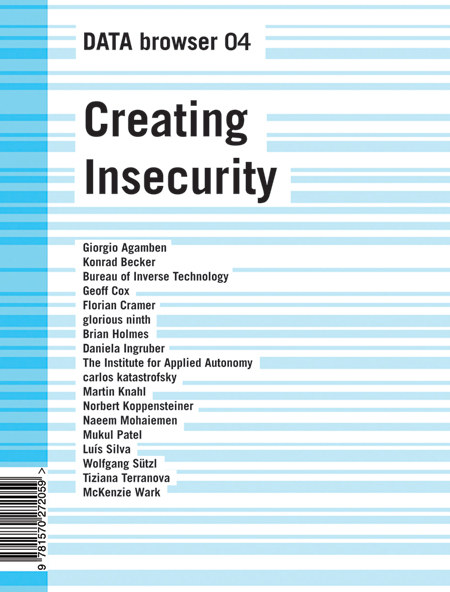 But security – reducing plural, spontaneous and surprising phenomena to a level of calculability – also seems to operate against a political legitimacy based on possibilities of dissent, and stands in clear opposition to artistic creativity. Being uncalculable by nature, art is often incompatible with the demands of security and consequently viewed as a ‘risk’, leading to the arrest of artists, and a neutralisation of innovative environments for the sake of security. Yet precisely the position of art outside the calculable seems to bring about a new politicisation of art, and some speak of art as ‘politics by other means’. Has art become the last remaining enclave of a critique of violence? Yet how ‘risky’ can art be? The contributors to DATA browser 04: CREATING INSECURITY address these questions at the intersection of art, technology, and politics. The DATA browser series presents critical texts that explore issues at the intersection of culture and technology.